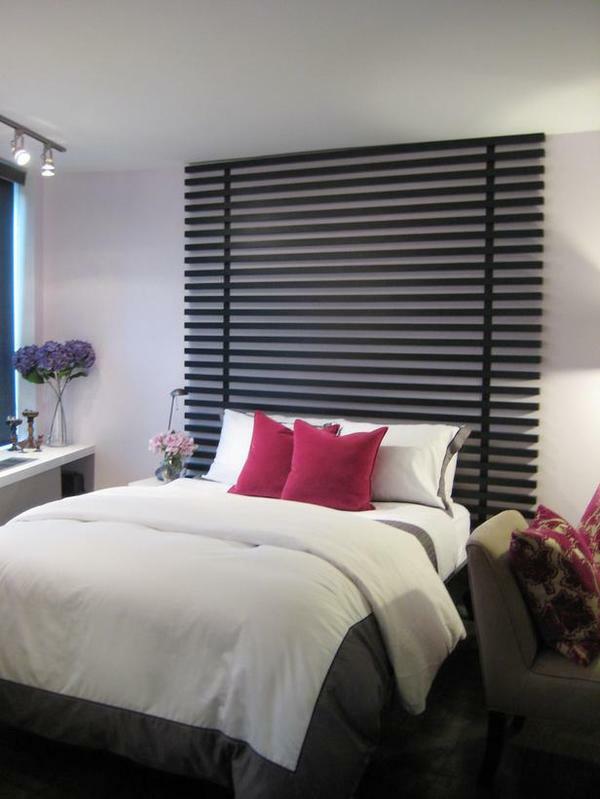 In many cases, a bedroom is not complete until it has a stunning headboard as its focal point. 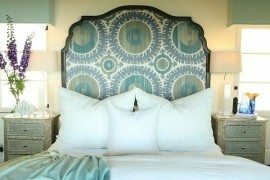 Whether your style is modern, rustic, simple, or decadently luxurious, there are tons of great ideas out there for creating your own custom headboard to compliment your bedroom retreat. 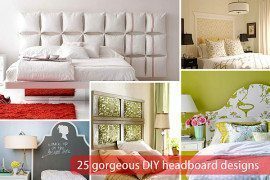 So rest easy, because I am here to share some beautiful DIY headboard inspirations with you today! Our first DIY project is a lovely, graphic headboard by The Inglenook Decor that was created with wood, leftover chalkboard paint, dustless chalk, and a vintage silhouette. 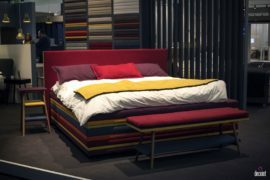 And thanks to the cute phrase written on the headboard, you will never wake up grumpy again! Another great idea for a DIY headboard is to think soft, as upholstered headboards are all the rage but cost a pretty penny from the store. This beautiful tufted, upholstered headboard, by Sarah M. Dorsey Designs, sports a navy fabric and gold nailhead trim to complete the bedroom’s chic look for under $150. 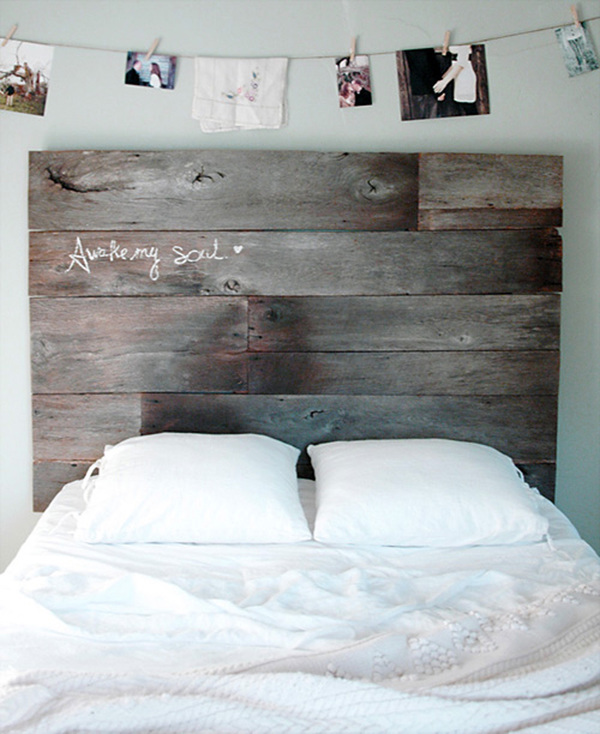 Want a simple and rustic headboard for your bedroom? Then this DIY beauty by 508 Restoration & Design is right up your alley. Made of authentic oak barn wood, the headboard also displays a song lyric that is significant to the couple. A more modern and sleek option for a DIY wood headboard is this one, submitted to HGTV’s Rate My Space website by user 4oclock. Creating a wonderful visual interest by drawing the eye all the way up to the ceiling, this headboard is a great, bold focal point for any bedroom (or even in a tiny studio, such as the room here!). Our next DIY headboard really took my breath away! Handcrafted out of corrugated tin by Kara Paslay Designs, this headboard adds an amazing metallic shimmer and pizzazz to any bedroom. Bookworms everywhere will love our next DIY headboard, created by Design Every Day. 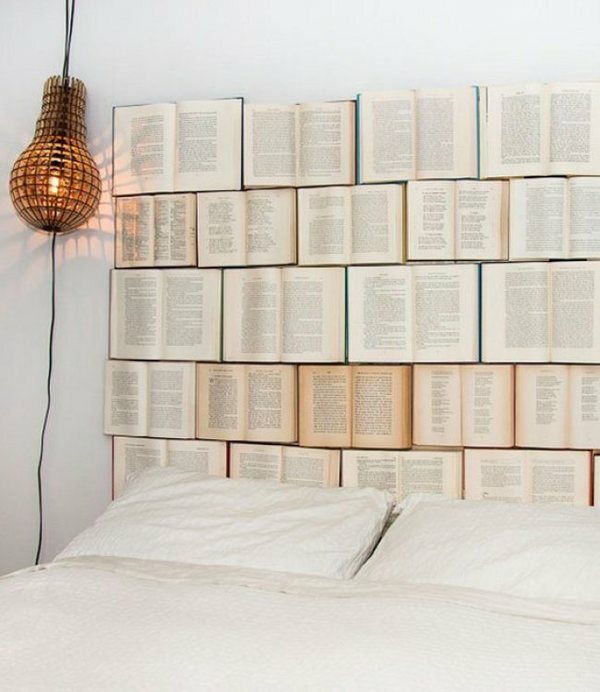 Go to the thrift store or used books store, gather some old books, nail them to a piece of wood, and tape down the top few pages to cover the nails to get a one-of-a-kind art piece to serve as a headboard in your space. Pick pages from books that you love to make the piece even more meaningful! 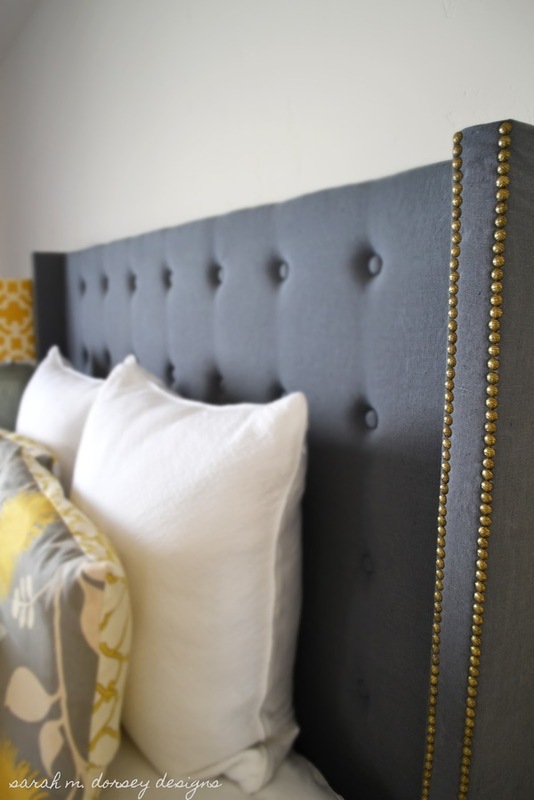 Since we all know I love branch projects, I had to include this DIY headboard from Shelterness! 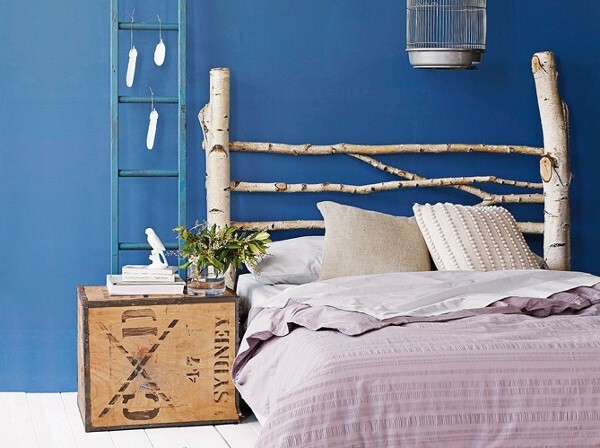 Simply constructed with birch tree branches and nails, this headboard gives natural beauty to any space. 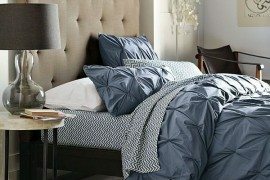 Just like the warmth and charm of a patchwork quilt, our next DIY headboard by Better Homes and Gardens will add unique character to your space. By wrapping individual foam squares in fabric and attaching them to plywood, your options for customization are practically endless! 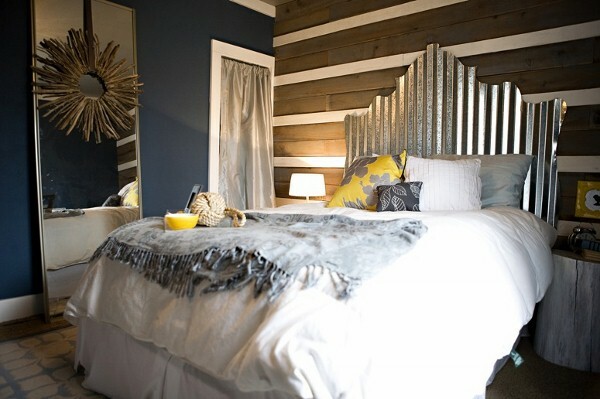 I know she has already made an appearance in today’s list, but Kara Paslay Designs sure has a knack for DIY headboards! 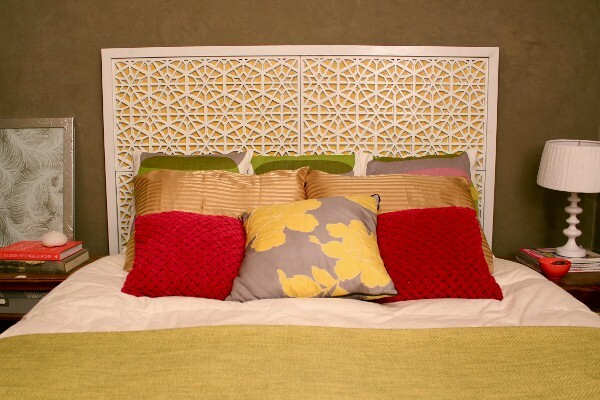 This incredible West Elm inspired Moroccan headboard was made using four rubber door mats, painted plywood, and trim. Why stop your headboard at few feet above the bed… or at the top of the wall for that matter? 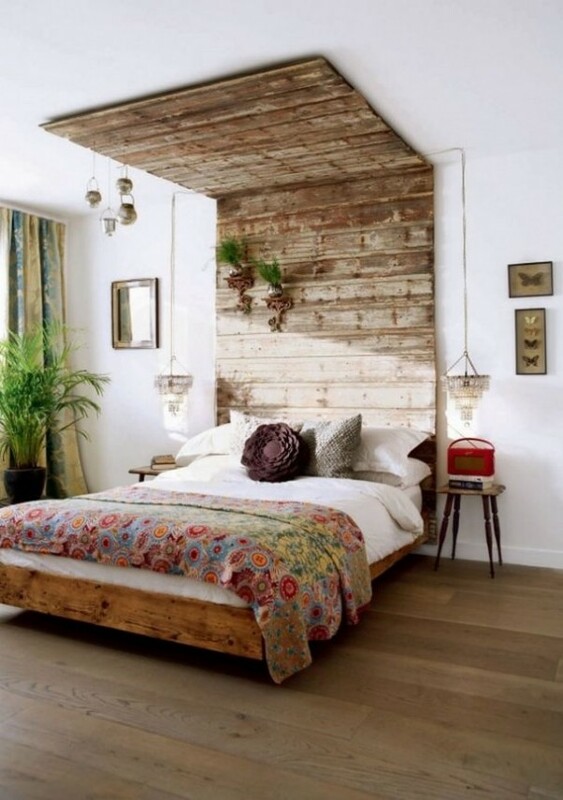 Our next DIY headboard, by House To Home and LivingEtc, takes reclaimed wood all the way onto the ceiling to form a sort of visual canopy for the bed. Add a few vases and greenery to truly bring the feel of nature indoors. 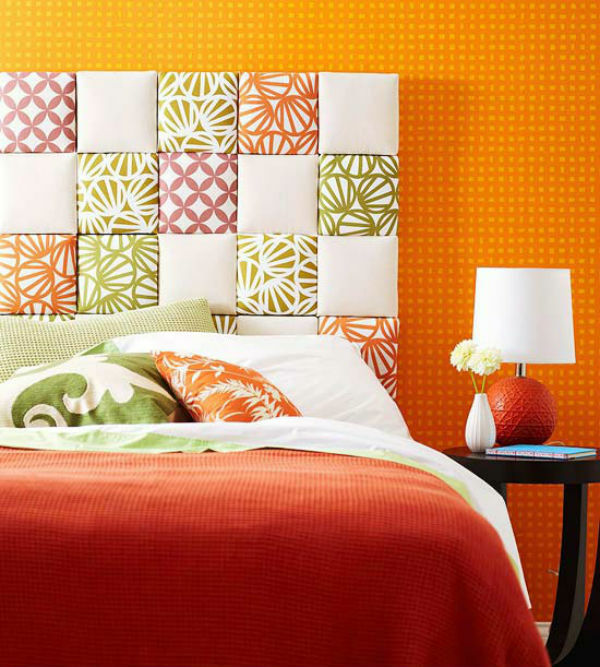 Our next DIY headboard is fun and funky, adding color and asymmetric intrigue to the bedroom. 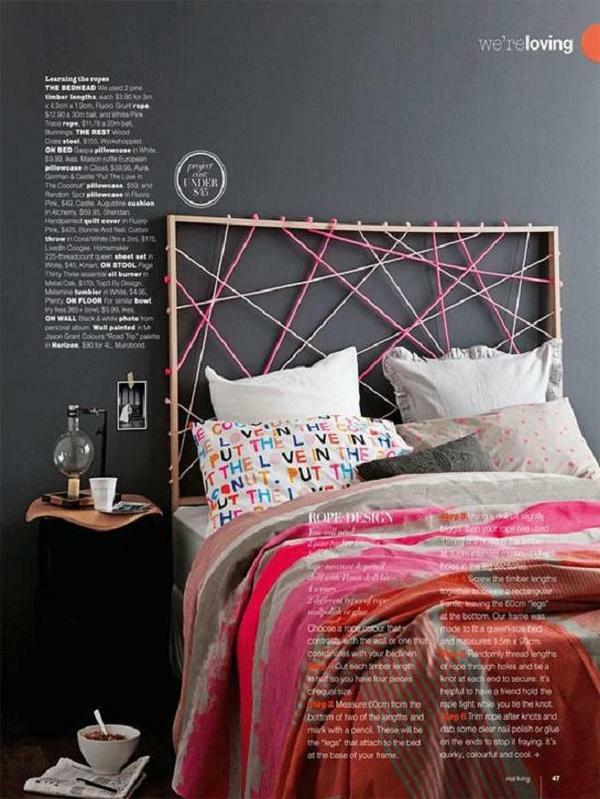 By Erin Michael for Real Living and featured on Poppycock, this headboard was crafted using a wooden frame with evenly-spaced holes and colored rope tied between various holes. Our final headboard by HGTV recycles old shutters to create an elegant and adorable headboard with a whimsical cottage charm. 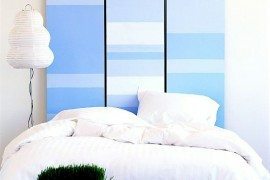 I hope this list of inspirational headboards will send you off with sweet dreams of making your own DIY headboard. 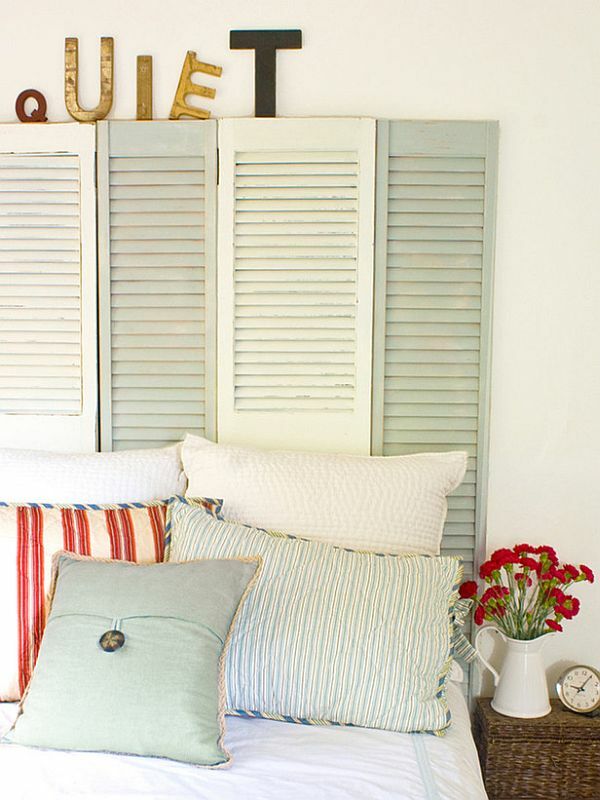 Have a great DIY headboard project of your own? Share it with us in the comments section below!